There's still some polish left to be done, but it could now be considered as being finished. Well, I'm not sure I consider it finished yet because I know of several things left I would like to add or do better. At the very least though, it's now kind of screen shot worthy. But as I've mentioned before, don't expect much. This first screenshot shows the tab for configuring all the basic settings for the client. It's not a pretty layout. I hate organizing controls in a dialog like this, because you add one thing, and everything gets messed up. Pay no attention to the button at the bottom. That's just a shortcut I added to open the settings ini file, for convenience. All the controls work as expected. Some disable/enable at connect/disconnect. The Nick Name box will send the /NICK command when the name in it is different and you press enter while connected. 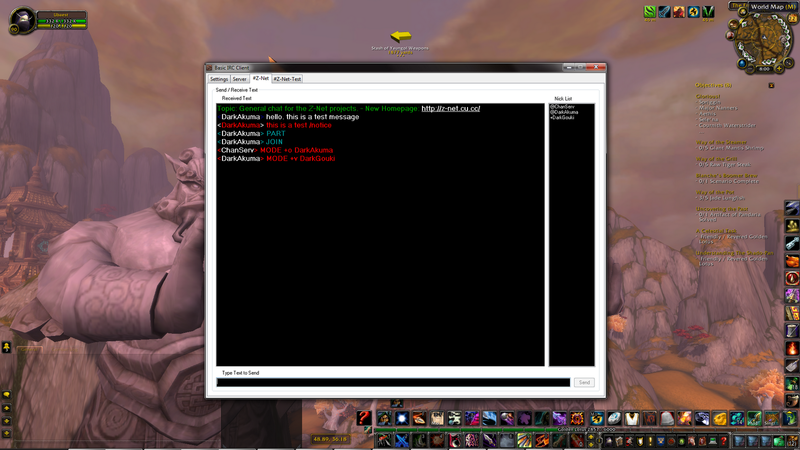 This second screenshot shows what a chatroom window looks like, complete with a few demo lines. Also seen is the use of colors, both for text and the background of the controls. The url link seen at the top is underlined, because it does infact work and open up your browser just by clicking on it. Whats not seen is Right Click context menus. One pops up when clicking the name of a tab, allowing you to select to close that tab. One shows when clicking the chat buffer to copy any selected text to the clipboard. And another shows when clicking the nick name list, showing a short list of basic IRC options you might expect from doing so. The Send button is disabled only because there is no text being typed. The server window and PM windows aren't shown, but they look exactly like the shown chat window, except without a nick list. Yea. Nothing extraordinary. But it IS an IRC client. And should serve well as a base for a project like Z-Net 3. What I have left to do on it is. I'd like to add code for allowing the window to be resized. And thus resizing the controls appropriately. The auto reconnect code still has issues. I'd like to comb through the code and comment more things. A few bits of code could stand to be refined. Also, unlike most IRC clients, this doesn't support DCC transfers yet. I'm uncertain if/when I want to work on that any time soon. I'd want it for Z-Net 3, I'm just not sure I consider it a basic IRC client feature, or that I feel like the hassle of going through adding it. Doing so is an entire sub project. As far as releasing this. Well, in this form, it's grown beyond what I'd want to release as the commercial project I've mentioned. I could make the program simpler to use, and it could stand to see attention given to it to make it look more appealing. So if I go with that plan, I would likely copy the code to a new project and start peeling it back. Now that this is shown, keep in mind that Z-Net 3 will likely not look anything like this. I have a different layout in mind for that. With this IRC client now at this stage, I may soon start working on the GUI for Z-Net 3. But due to WoW, lately I've been having a hard time getting as much done with programming as I would want. 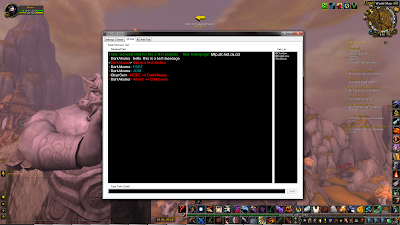 You can even see I used WoW running as a background in the screenshots. If I do start working on it soon, it may be awhile before I try porting the IRC client code into it as like I mentioned, I still have more I want to refine with it.